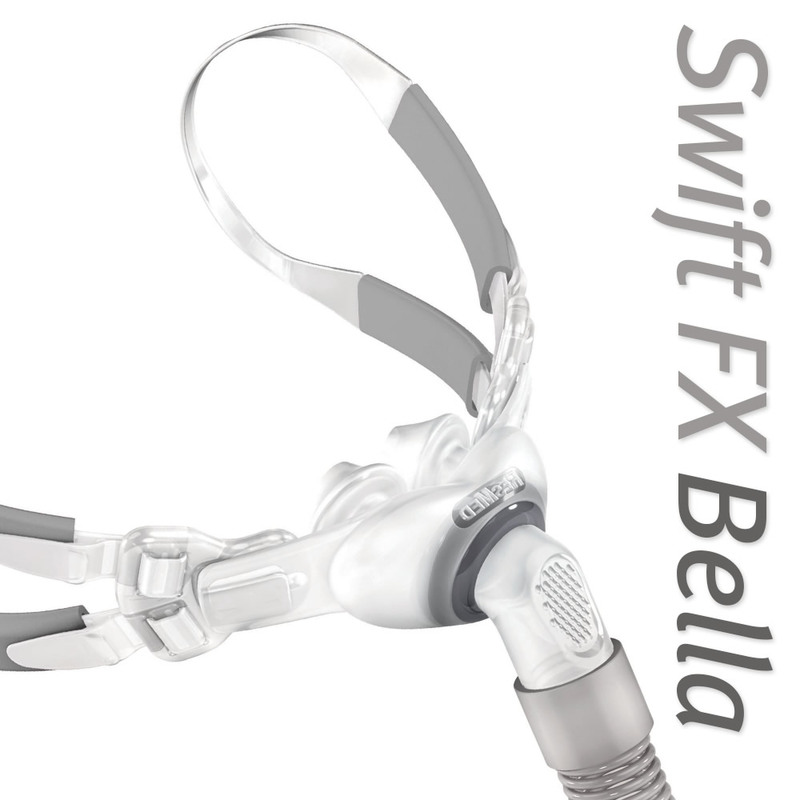 ResMed's Swift FX Bella offers all of the advantages of the Swift FX with the added benefit of Bella Loops. Bella Loops are a truly unique headgear option that gently curves around the ears to create a secure fit and eliminate the confines and crush of more traditional headgear straps. 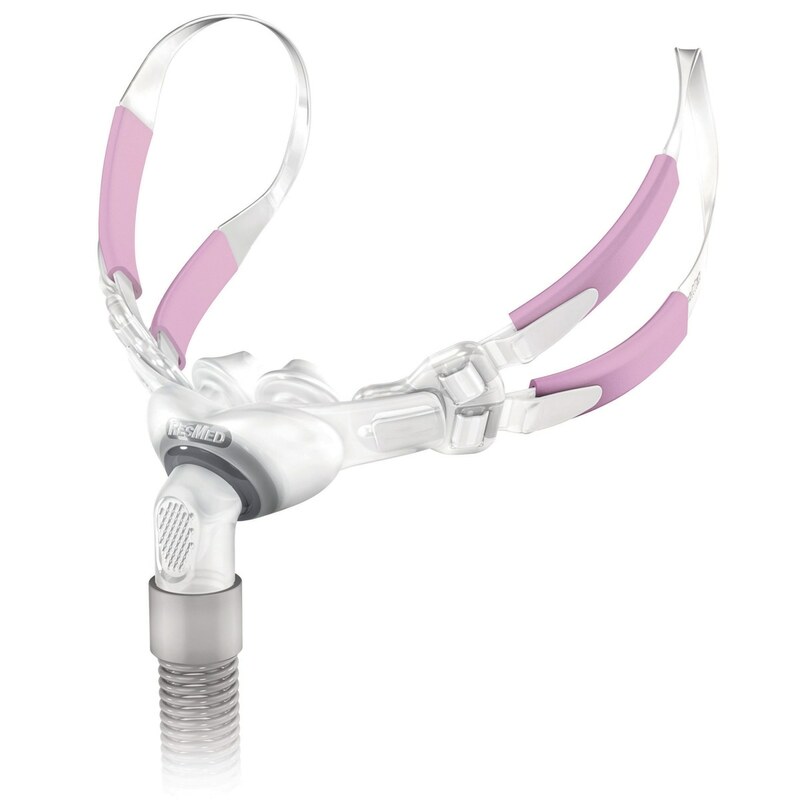 Intelligent Enhancements for Men & Women: The Swift FX Bella is available with different nasal pillow sizes and headgear colors to fit a wide range of men's and women's preferences. Headgear is available with pink or gray highlights; while nasal pillows are available in four sizes Extra Small, Small, Medium and Large. 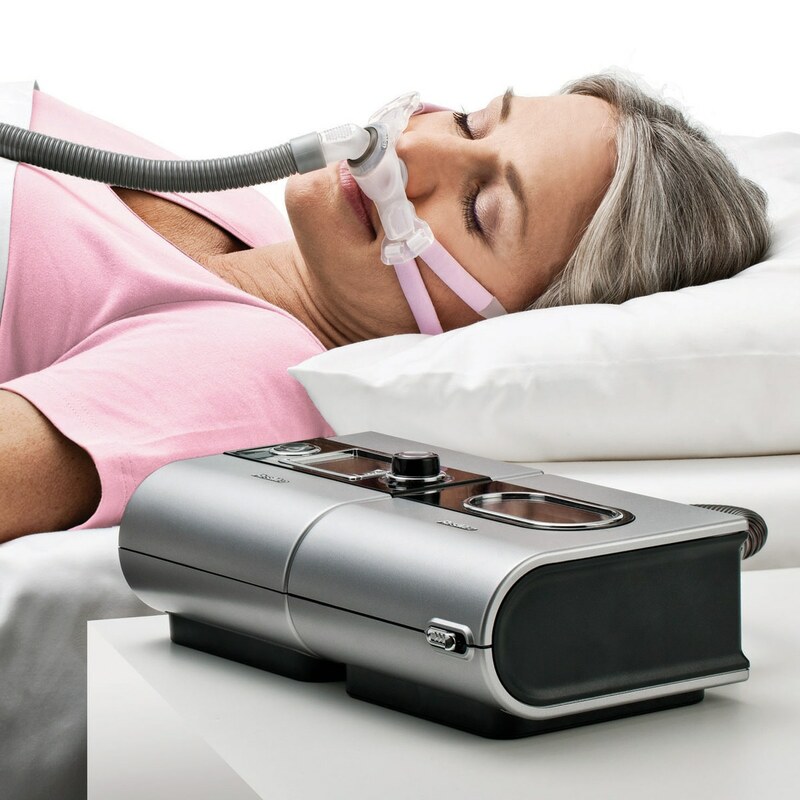 Compact, Lightweight, Open Design: Swift FX Bella Gray and Swift FX Bella CPAP/BiLevel Masks feature a compact design, made of ultralight materials, that flexes and moves with the you as you sleep. The simple, elegant design promotes a natural seal that requires minimal facial contact and has no rigid plastic frame or annoying forehead support. Dual-wall Nasal Pillows Provide a Soft, Secure Seal: Identical to the pillows found on the Swift FX, Bella's innovative Nasal Pillows feature a soft outer wall for comfort and a secure inner wall for support. Swift FX Bella pillows rest on an integrated flexible air chamber that adapts to your natural movements during sleep providing a soft, and secure seal even for the most active sleepers. Unique Bella Loops Headgear for Comfort: Swift FX Bella's Loop Headgear is truly unique with two soft silicone loops that gently curve around the ears to promote a secure fit and eliminate the confines and crush of more traditional headgear straps. Because Bella Loops are so minimal they work well in any sleeping position. 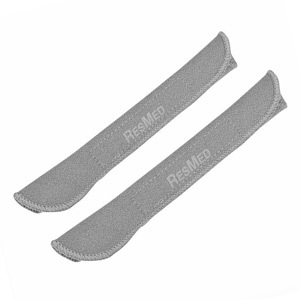 In addition ResMed includes soft wraps in each mask pack for added comfort. 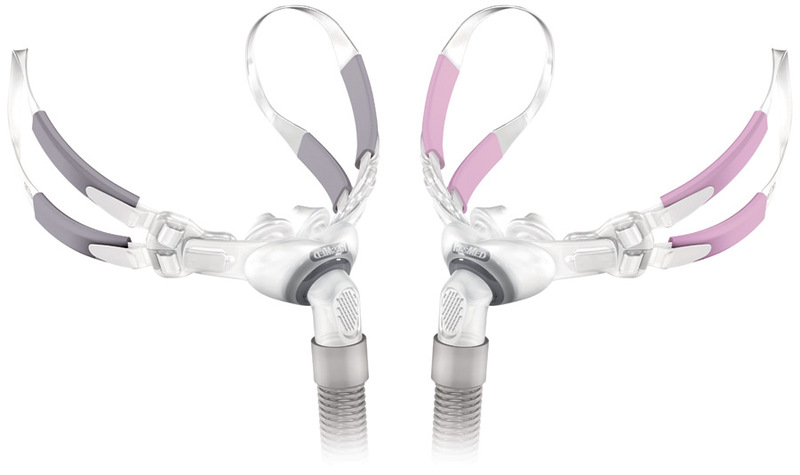 SpringFlex Tubing with Swivel: ResMed's Spring-flex connector tubing reduces pull on the mask, bending and stretching to minimize drag and enhance stability. A swivel built into the tubing allows 360° rotation for even greater reduction of torque and drag. 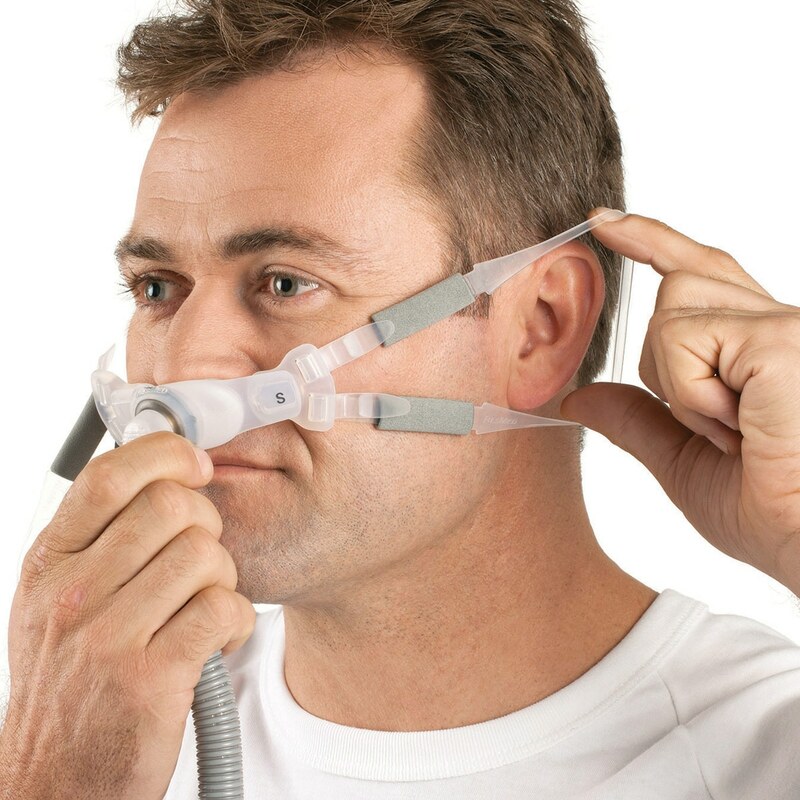 Simple To Use & Easy To Maintain: With just 3 parts -- headgear, nasal pillows, tube -- the Swift FX Bella is easy to assemble, easy to adjust, and easy to clean. Because all of the mask parts are soft, and there is no hard frame, the Swift FX Bella Gray & Swift FX Bella are great for travel too. 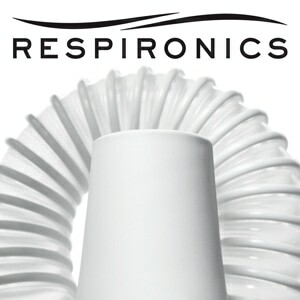 Ultra-Quiet Diffused Venting & Performance: Tiny whisper-quiet vents in the elbow of the Swift FX Bella gently diffuse air as it is exhaled -- reducing noise and distributing air away from you and your bed partner. I really enjoy wearing the mask with the ear attachment much better than the headgear. This is a re-order because I like this better than many other masks. Problem with the service though. It has yet to arrive, and it has taken too long. 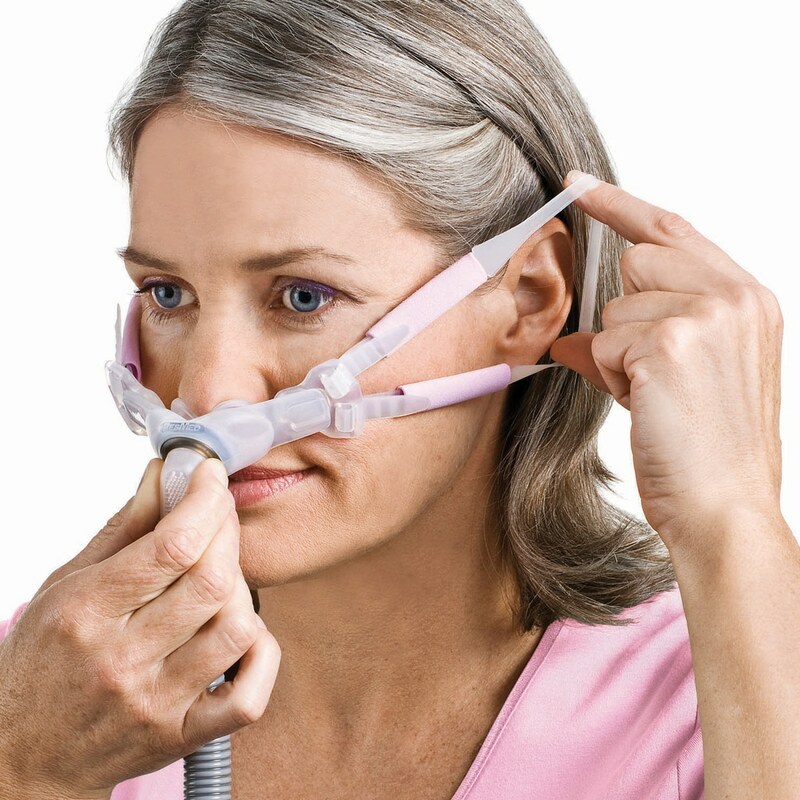 Selecting a CPAP mask can be a difficult thing. Full masks don't always give you a good seal, especially if you have a mustache like me. I was fortunate to be tried on full masks & nasal pillow masks, 22 years ago, before I did my sleep test at the Mayo Clinic. 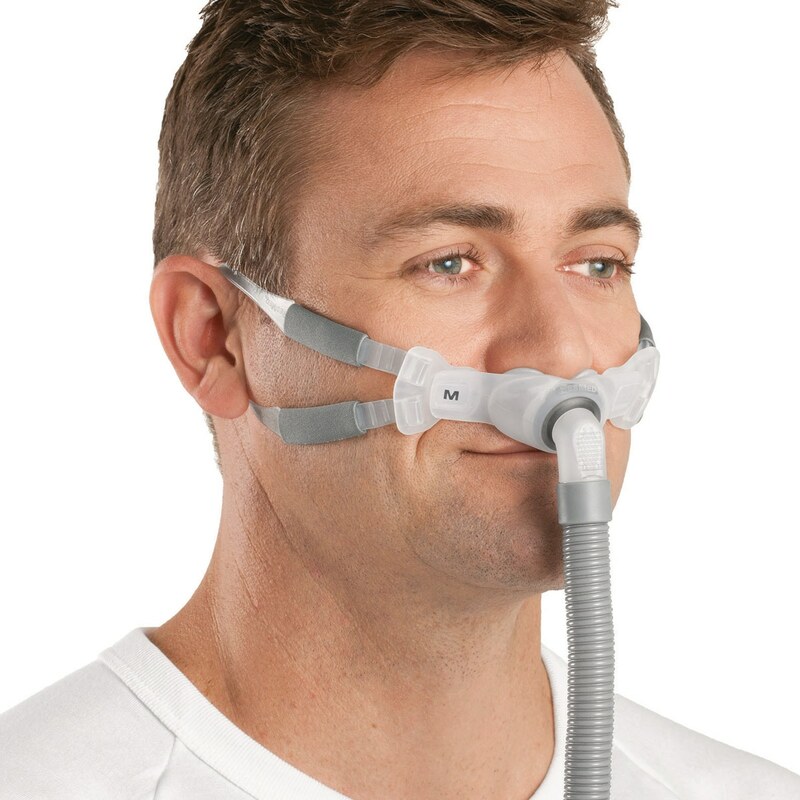 The company in Minnesota that I bought my CPAP from took an hour or so fitting me with various masks thoroughly, until I settled on a nasal pillow with an Adam Circuit. Since then I have tried other styles of nasal pillow masks with varying success. I jumped at the 30 day free trial of the Swift FX Bella because it offered the possibility of using it without headgear (headgear presents its own problems, not the least of which is adjustments). I tried another style without headgear, but never could get a good fit. 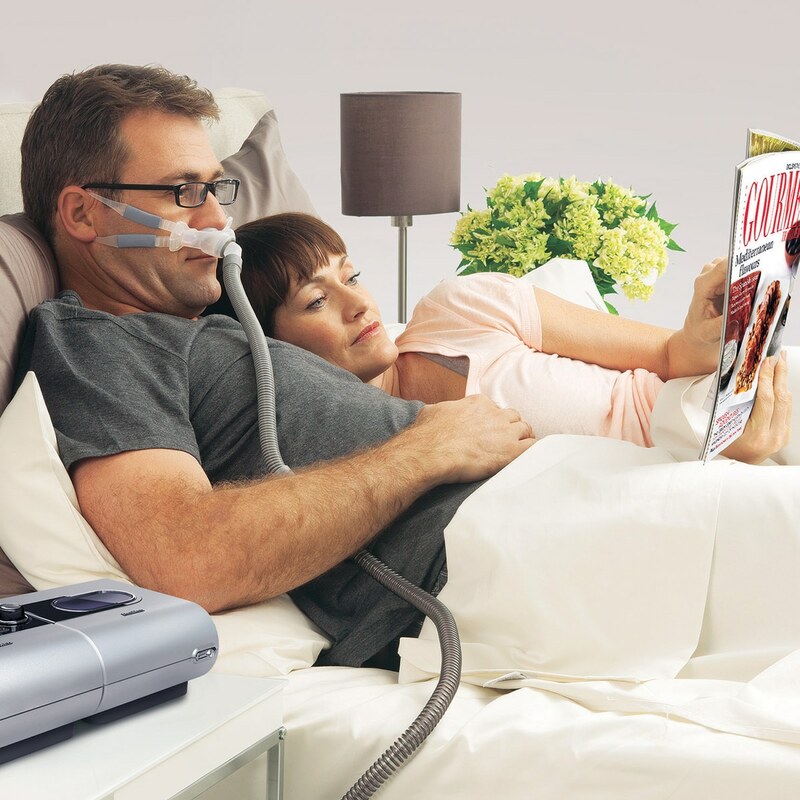 With any CPAP mask there is a certain "break-in" period, where you might experience irritation or other problems. 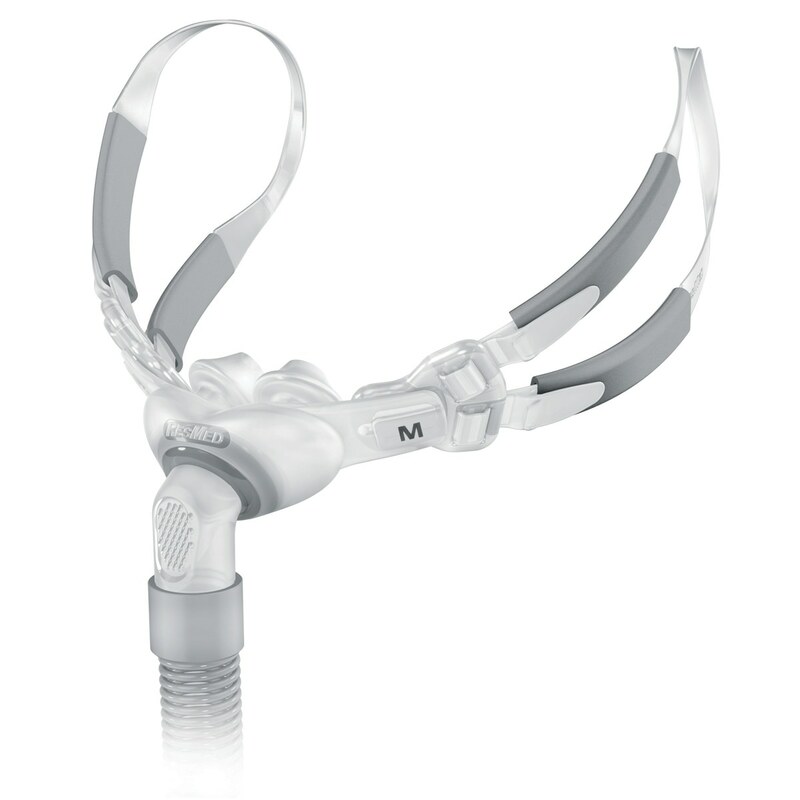 The only break-in "problem" I encountered with the Swift FX Bella is some discomfort behind the ear where the strap goes - which I had anticipated from my first experience with a CPAP. 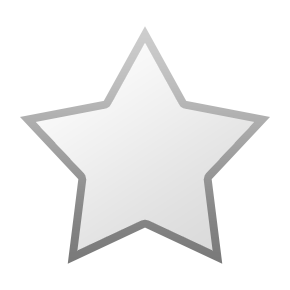 With time, this decreased to the point where I seldom have discomfort behind either ear - usually, but not frequently, it is after I have been asleep for a few hours and wake up to go, and find there's pressure behind my ear. It only takes a simple adjustment of the strap and I'm back to sleep after my trip to the bathroom. 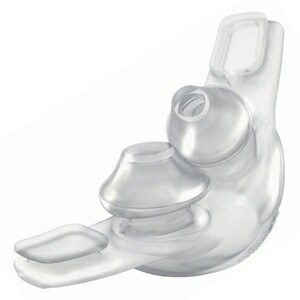 The Swift FX Bella is the best nasal pillow mask I have ever used continuously or experimented with. 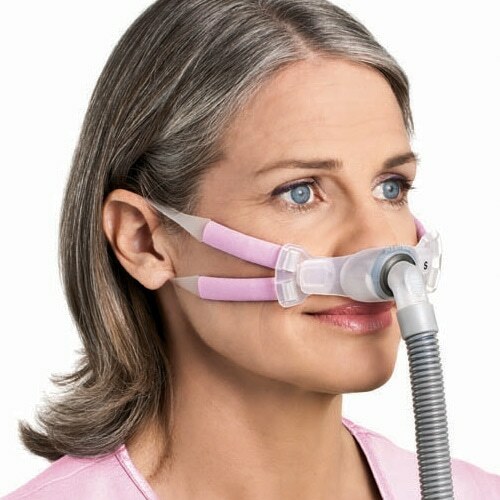 I prefer it over my original Adam Circuit nasal pillow mask (and the others I've tried). In addition, the FX Bella's swivel is great - I much prefer it to pillow masks with the hose attaching on the side without a swivel. I have used it for over 2 months now without headgear and haven't experienced the hose hanging up when i turn over. The bias vent is angled away so that I am very very rarely bothered by air blowing back on me, as with my other masks. It comes with Small, Med, and Large pillows - I use the medium. I tried it with the large, which were too big. The only drawback is the manual - it could be clearer, more descriptive about removing & replacing the pillows, and the straps ... BUT this should NOT deter you from trying the Swift FX Bella ... especially if you already use a nasal pillow mask. I don't get it. Straps are very uncomfortable wrapped around ears. Does not stay in place well. I really liked that you got 3 (xs,s,m) sizes.I can use all 3 as long as I adjust the straps on the head gear.So far I'm not getting any air leaks.I love it! I've only had the opportunity to sleep one night with this new mask, but it went very well. I'm using the ear straps and I'm really looking forward to not having a strap mark through the hair across the top of my head! The ear straps are really lightweight and comfortable. Not sure yet if the plastic straps will leave marks on my cheeks--I sure hope not! My only problem was figuring out which side of the nasal pillows was UP and which was DOWN...I finally decided that the word RESMED should go across the top when I have it on, so I'll feel for that as I put it on each night. Looking forward to enjoying this mask! Love this system. I have thick, naturally curly hair that is also fine and soft. Regular head gear caused my hair to have terrible tangles. The Bella ear loops are perfect. I had to learn to adjust the pads so it did not rub a tender spot behind my ear. Once I did that, no problems. I strongly recommend this system. I have lots of curly thick hair and I had to wear a soft head band with the regular over the head style headgear or my hair would get caught up in it. And this led to flat curls in the morning! I admit it's all vanity but I really like the new ear loops on the Swift FX Bella. It takes a little getting used to having it behind your ears and you need to practice tightening the straps. I find making them completely loose putting on the mask then (both sides together) tighten the bottom then the top. I also found that if I put a little lotion behind my ears it keeps it from irritaing the skin. My only complaint is that you can't replace the little pink covers. With the over the head stle I'd replace the strap wraps every couple of days. Now I have to wash them and hope they dry by bedtime. Most women put "stuff" on thier faces at night so they get dirty quickly. It just makes sense to have replacements available. I like the Bella Nasal Mask. I purchase this product because I have thick hair and want to try a mask that does not have to go over my head. However, the strip rested against my bone behind my ear, and it hurts. If I loosen the straps, I hear the sound of rushing air, which causes a restless sleep.